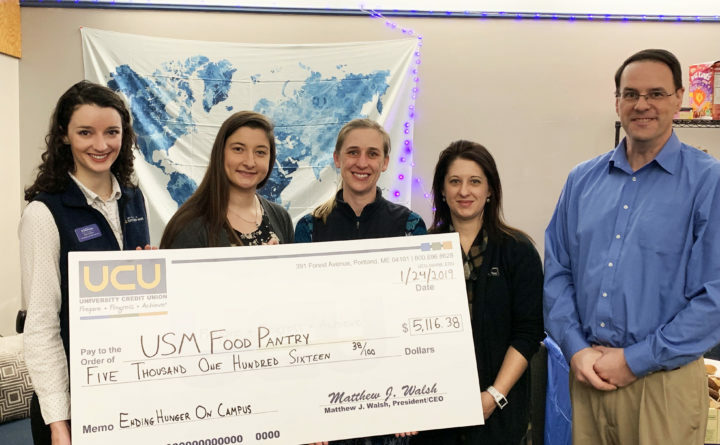 USM Food Pantry L-R: Alex Carrier, USM Coordinator of Student Activities; Madeleine Lutts, USM Graduate Assistant, Commuter Student Services & Food Pantry; Steph Beck, UCU AVP of Marketing; Maddy Gray, UCU Branch Manager; Matt Walsh, UCU President/CEO. USM Food Pantry L-R: Alex Carrier, USM Coordinator of Student Activities; Madeleine Lutts, USM Graduate Assistant, Commuter Student Services & Food Pantry; Steph Beck, UCU AVP of Marketing; Maddy Gray, UCU Branch Manager; Matt Walsh, UCU President/CEO. ORONO — In the second year of its annual Ending Hunger on Campus Campaign to bring attention to food insecurity among Maine college students, University Credit Union raised $25,119.62 for eight self-funded food pantries within the University of Maine System ─ more than triple what the credit union raised in the first year of its campaign. For more information on UCU’s Ending Hunger on Campus in Maine campaign, visit www.ucu.maine.edu/endinghungeroncampus/.